Why did God make such a big, sweeping statement to Abram? Because, according to Galatians 3:8, He had just preached to him the gospel concerning His Son and HE BELIEVED GOD. How did he do that if there was no written word until Moses? The entire New Testament is written in the stars. 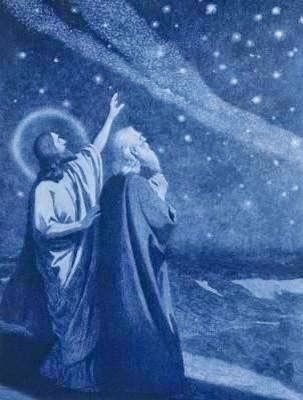 He recounted to him the gospel story written in the night sky! All of creation, all of history is HIS STORY. The Bible, likewise, is all about that one magnificent, unselfish, incomparable Person: JESUS! It is not at the Name of God that every knee shall bow but AT THE NAME OF JESUS EVERY KNEE SHALL BOW!!! Everywhere you look, He is there, in every line, every story, even in the Hebrew language itself. In fact, the very first two letters of the very first word in Genesis 1:1 spell “Son: Bar (בָּר). Yes, JESUS! Let’s go see what is on God’s mind! What an amazing, all-encompassing blessing God gave to Abram! 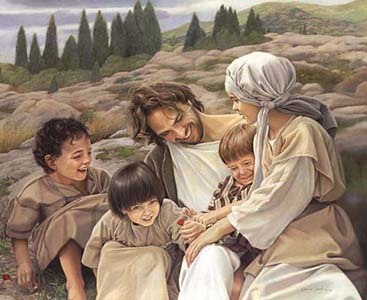 Not only did God bless him, He would make his name great and make him a blessing to others. The cool thing about Hebrew is there’s always more to words than just their definitions. Through these words for bless and blessing, “Barak/Beracha,” respectively, the Father is once again glorifying His Son! He demonstrates definitively through the Hebrew letters that THERE CAN BE NO BLESSING WITHOUT JESUS! Hebrew is a language of picture writing, like Chinese. These pictures are very consistent and tell us a story you would never get from the definition. They also give us a glimpse of God’s perspective. It reads from right to left as you know. There is no blessing without THE SON! “Kaf” (כ) is a picture of a curved hand extended in blessing. The hand is curved like it would be if you placed it on someone’s shoulder. It is a picture of the laying on of hands. At the far left, the letter “hei,”(ה) has been added. It means, “Grace.” Why? The fifth letter of the Hebrew alphabet, it is a picture of an open window. And what does God pour out of the windows of heaven? Blessing! He blesses us with His grace. That’s why “hei” means “GRACE!” Because it is also the number “5,” five is the number of Grace! There can be NO BLESSING WITHOUT THE SON: JESUS!